The Panasonic Lumix DMC-FX40 (also known as the DMC-FX48) is a small and light compact camera aimed firmly at the point-and-shoot user. At first glance the FX40 is rather unassuming, with a standard 2.5 inch LCD screen and rather understated styling, but there are a couple of stand-out features. The 5x zoom lens is the main one, an unusually versatile focal range on such a small camera, but even more so when you find out that the Panasonic FX40 offers a wide-angle setting of 25mm. The second is the ability to shoot high-definition 1280 x 720p video at 30fps, a feature retained from the previous FX37 model but still something of a rarity in this class of camera. Other improvements from the FX37 are more subtle - new 12 megapixel sensor, faster Venus Engine V processor, and an upgraded face detection system that can recognise previously recognised faces. 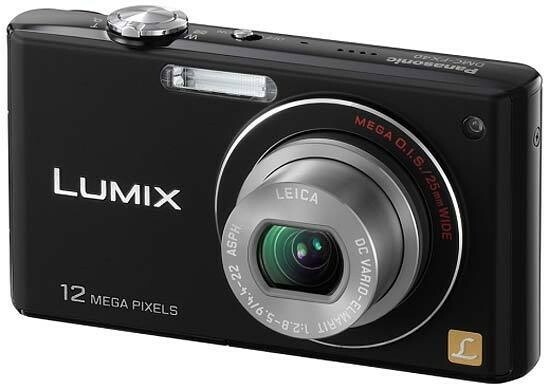 The new Panasonic DMC-FX40 is available in black, red or silver and has an official list price of £259 / $349. We find out if the DMC-FX40 is a worthy addition to Panasonic's extensive range of stylish compact cameras. Digital point and shoots are seemingly two-a-penny and most feature an identical range of functions, making it even harder to tell one model apart from another - particularly if they come from the same manufacturer's range, in our case Panasonic's ever-swelling Lumix family of compacts. So what does the DMC-FX40 have to make it stand out from both a crowd of rivals, and in addition its closely priced and specified siblings? On first impressions, not a great deal. The Panasonic Lumix DMC-FX40, available in black, silver or red in the UK at least, is of almost identical credit card dimensions to the recently Photography Blog reviewed FX550, its rounded edges ensuring it's marginally less boxy. Marketed as a natural step up from the FX37, it is at the time of writing some £40 cheaper than the FX550 at a UK manufacturer's asking price of £255. While it shares similarities with that step-up model, there are also notable differences. The familiar includes a 5x optical zoom with a 25-125mm equivalent range (in 35mm terms) - making it suited to both landscapes and portraiture - plus an 'extra' optical zoom boosting it to an equivalent 9.8x, albeit with attendant resolution drop to 3MP. Backing these up are, again, a 12.1 megapixel effective resolution, Venus Engine V processor (reportedly 2.4x faster than the previous generation and 16% more power efficient), plus the regulars of HD movies (maximum 1280x720 pixels at 30fps, 16:9 format), intelligent auto (iA) and face detection. Here 'FD' can recognize previously captured faces - a bit of a gimmick - and if you register your baby's face with the camera, it'll automatically switch on the baby optimized scene mode when granny next points the camera at the little 'un. Where the Panasonic Lumix DMC-FX40 deviates is that there's no touch screen operation this time around, just a regular 2.5-inch, 230k dot resolution LCD with auto brightness adjustment. There's no fancy instant zoom button that propels the user through the focal range in one smooth transition either. But otherwise the two cameras look and feel very similar. Once again construction mixes plastic with mainly metal to ensure the Panasonic Lumix DMC-FX40 feels robust when gripped in the palm (at a weight of 150g with card and battery), and will survive the odd knock or fumble. That said the metallic lens surround of our review sample did arrive slightly scuffed and scratched, consistent with being kept in pocket with loose change and (possibly) keys. With supplied lens once again Leica branded, the front of the Panasonic Lumix DMC-FX40 is a reasonably plain affair, with lozenge shaped window for the flash nestling left of the optic, and an AF assist/self timer porthole top right. The best that can be said about it is that it's clean, unfussy and, unlike Cyber-shot snappers from Sony, resembles a traditional camera in both dormant and active states. The top plate is similarly minimalist, with - set into a reflective chrome strip that runs around its edges - a large shutter release button encircled by a zoom lever with a raised lip at its front, in order to provide active purchase for the forefinger. Next to this we have a small, partly recessed on/off switch and built in microphone and speaker (both mono). While none of these signifies 'cheap', the zoom lever on our review sample felt a tad loose. Still, its action is commendably smooth and steady, sound-tracked by a very low operational buzz. One disappointment though is that the optical zoom cannot be deployed whilst shooting video; it merely stays fixed at the point it was before the user pressed the shutter button to commence recording. Similarly, if the camera is in playback mode, a quick squeeze of the shutter won't throw the user back into capture mode - the switch for alternating between the two modes has to be physically 'thrown' first. Panasonic quotes shutter lag as a blink and you'll miss it 0.007 seconds, same as the FX550. We also get the ability to shoot a burst sequence of images at 2.3 frames per second, at full resolution, or 10fps if we compromise on picture quality. Take a shot in single capture mode and the FX40 takes 2-3 seconds to write it to memory (40MB internal capacity or optional SD or SDHC card), the screen briefly blanking out and then freezing with a preview of the captured image. Still, it is lighting fast to determine focus and exposure - providing there's plenty of light around that is - letting the user know with an affirmative 'bleep'. For close ups, a 'macro zoom' is available this time around in the shape of a 3x digital zoom; this is accessible as an alternative when selecting regular macro mode. With macro enabled via a press of the relevant cross key at the back of the Panasonic Lumix DMC-FX40, main shooting modes are selected via a twist of the bottle top-style mode wheel set unobtrusively into the top right of the camera back, so most settings are obscured apart from the one in use and that immediately next to it. Turn the physical dial and a virtual version pops up briefly on screen explaining which mode has been selected. First on the dial is the aforementioned intelligent auto, followed by 'normal picture' (program AE), and scene modes. This third setting, if twisting the dial clockwise that is, contains a plethora of pre-optimised, user selectable options for common subjects and conditions: a whopping 27 in total. Thus we have not one but four portrait modes - to include self portrait and the curious 'transform' mode which stretches your subject to resemble someone looking into a fairground hall of mirrors. New amongst these is panorama assist mode; yet the Panasonic Lumix DMC-FX40 doesn't automatically stitch together images in camera when you've finished shooting, which would have further enhanced the user friendliness. Relevant software is provided on the CD. Indicating the camera is aimed at family users, there are two baby modes, while for the more adventurous there are fun pin hole and film grain modes, plus an underwater option. Next on the dial is the video mode, which provides access to quality and auto or manual white balance settings via a drop down toolbar, running across the top of the monitor screen. With a press of the menu button users can also adjust colour mode if so desired, switching to sepia, black and white, or giving footage a cool or warm look. Incidentally as a default the Panasonic Lumix DMC-FX40 appears to err on the side of warm anyway. The last setting on the dial is a two megapixel clipboard mode for reference shots - maps and travel times when on holiday for example. While the 4:3 ratio screen is bright and clear, if shooting video in 16:9 format, black bars crop the top and bottom to provide a more cinematic look and a better indication of how the eventual results will appear. As with previous generations of Lumix, on-screen menus and user options are presented in a clear and straightforward manner, its manufacturer adding a new display size option this time around. Press the 'display' button on the camera back and screen information can be turned on or off for a clearer composition, or a nine zone grid overlaid for those who want to practice the Rule of Thirds. In the absence of any optical viewfinder, battery life is good for 350 shots from a single charge, which is both fair and comparable with rivals. In between the shooting mode dial and cross keys is located the aforementioned slider switch for flicking between image capture and playback, its diminutive size meaning that thumbnail operation is required. The other buttons on the Panasonic Lumix DMC-FX40 back are similarly small, save for the larger self-explanatory menu/set button nestling at the centre of the four cross keys. At 12 o'clock we have a button for calling up exposure compensation on screen, with a slider indicator allowing adjustment between the standard -/+ 2EV in 1/3 increments. At three o'clock we get access to the flash modes; here these are auto, auto with red eye correction, forced on, slow sync with red eye correction or flash off. 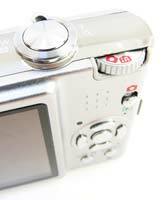 With the display button to the left of these directional controls, that also provide a means of tabbing through on-screen menus, captured images in playback, and function selection, to the bottom right is the final button on the camera back, marked 'Q. Menu'. As with its predecessors, this enables access to a 'quick menu', provided via an option-laden drop-down toolbar running cross the top of the screen. If not shooting stills in iA mode, this provides user access to image stabilisation options, burst shooting, AF area (spot, face detection, AF tracking, or 11-area), white balance, ISO (ISO80 - 1600), the addition of intelligent exposure, picture size and LCD mode. In iA mode such options are pared down to purely accessing picture size, burst shooting and LCD mode. While the left hand flank of the Panasonic Lumix DMC-FX40 (if viewing from the back) is bereft of any features, the opposite side features a flip-open door protecting two ports; one a joint AV out/USB connection, the other for an optional component cable for hooking the camera up to an HD TV set.The bottom of the camera is similarly 'clean', with a screw thread for attaching it to a tripod ranged far left, rather than in its usual positioning nearer the central axis. This has allowed for a larger door with sliding catch protecting the joint rechargeable lithium ion battery and SD/SDHC card compartment.